Church Street is one of the oldest thoroughfares in the Fort, for there are records of its existence from the early 18th Century. There is some doubt as to its exact location, the name having been given to at least two passages in the early years but by the mid 18th Century, the alley that connected James (now absorbed by Charles) Street and St Thomas Street was known variously as Church Lane/Row/Street. H D Love states that it was immediately south of the Church and ran on an east west axis. Today no such thoroughfare exists. When you walk out of the southern doorway of the Church of St Mary’s, you step into a beautiful walled garden on the other side of which is the immense bulk of the ex-servicemen’s hospital. 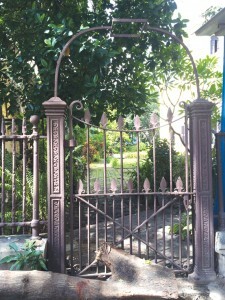 At the end of the garden, just before the health facility’s wall is a paved walkway with wrought iron arches at either end, connecting it with Charles and St Thomas Streets. If so, is the garden and the walkway the space occupied by Church Street? We can only hazard a conjecture. If this was indeed Church Street, it was not so peaceful in its heyday. Located on it were the Company’s calico godowns for quite some time, at least till the 1750s. As early as the 1690s, Nathaniel Higginson, the first Mayor of Madras and by then Governor, was writing about these godowns being much afflicted by the ‘white aunt’ by which he presumably meant termites and not a female relative. There are records of these structures being renovated shortly thereafter. By the 1770s, Church Street appears to have become what we would today call a mixed zone – there were warehouses and residences. One of the latter was where Warren Hastings came to live, at a rent of 108 pagodas a month. It is not clear as to who the owner of the property was. By the time he came to Madras, Hastings was an old India hand. Born in 1732, he had in 1749 been appointed a Writer in India. He proceeded to Bengal and, while there, married in 1756 the widow of a Captain Campbell who had been in Company service. Three years later his wife died. Meanwhile, Hastings continued to fare well professionally, becoming a Member in Council at Calcutta in 1761. He opted to return home in 1764 and five years later, having lost all his money in helping impecunious relatives, was bound for Madras, this time taking office as Second in Council. A gate for the Church Walk today? Hastings sailed on board the Duke of Grafton and his fellow passengers were Baron and Baroness von Imhoff. In contrast to the grand title, the couple was impoverished. The husband, Christohof Adam Karl von Imhoff, had served in the Seven Years War and was out of employment since 1763. He had been living in Nuremberg off the hospitality of relatives whose kindness he repaid by doing their portraits, an art in which he was not overly talented. In 1769, he decided to go to India, to try his hand at painting the native rulers and making a fortune off these low hanging fruits. Accompanying him was his wife Anna Maria Apolliana Chapuset. Hastings’ biographers vary in their views on the Imhoff marriage – Lord Macaulay claims she had nothing but contempt for her husband but G R Glieg simply states that they were not suited to each other. Whatever be the case, the circumstances of the voyage threw Hastings and Baroness Imhoff together, particularly so when he fell dangerously ill and she treated him with tender care, watching over him and administering medicines with her own hand. When he recovered, Hastings realised that he was deeply in love. Characteristically, he was to do nothing in a hurry. Having taken time to think matters over, he called in the Imhoffs and it was decided between them that the husband would file for divorce proceedings and till this was granted, they would continue to remain in the eyes of the public a married couple. Arriving in Madras, Hastings took up residence in Church Street. He threw himself into his work as the Number Two in the Council, reporting to Governor Du Pre. To quote from a third biographer Capt. L J Trotter, “the Company’s investments in silk and cotton goods had been of late so carelessly overseen that the roguery of the native contractors had brought about a marked decline in the quality of goods shipped to England.” The men referred to were clearly the dubashes. Hastings set about cleaning up the system. He had the duties of the Export Warehousekeeper entrusted to a separate officer under whom a team of trained clerks began working. Gaining proficiency in the local languages, he started dealing directly with the headmen of the weaving villages and soon the Company began to see the fruits of his labours. 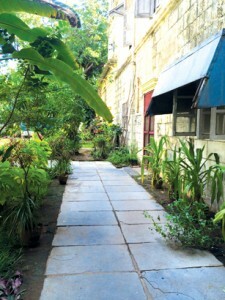 But in the meanwhile ton­gues in Madras kept wagging about his unusual private life. The trio had lived together till Imhoff, after ten months and having painted half the settlement, wanted to move to Calcutta to try his luck there. Anna Maria remained behind but Hastings very properly set her up in a different house and visited her regularly. Then, in October 1771, she sailed for Calcutta to join her husband. It may have ended as a shipboard romance but the East India Company suddenly decided to play cupid. It promoted Has­tings as Governor General (he was the first to be given that title) and ordered him to move to Calcutta. Sometime during his tenure in Madras, Hastings appears to have purchased the house on Church Street, for in his farewell note to the Council, he offered it for sale at 4,000 pagodas. Once in Calcutta, Hastings moved in with the Imhoffs, spending much of his time in building a vast house for the time when he would marry Anna Maria. The husband left India in 1773, to file for divorce in his native Franconia. He received a thousand pounds in two instalments from a relative of Hastings in return for a portrait of the Governor General. Anna Maria, by now Hastings’ beloved Marian, remained in Calcutta with the Governor General at Belvedere, his palatial home, his exalted status ensuring everyone kept silent at least in public about this. The divorce came through in 1777 and then Hastings married her, the bride being given away by Sir Elijah Impey, the Chief Justice and a schoolmate and close friend of Hastings. She was presented to Calcutta society in a glittering public event on August 11th and took up her official position as First Lady, though in private wags labelled her Hastings’ Governess. There were to be rumours that Marian dominated over him on official matters as well, leading to decisions that bordered on gross misuse of office but the marriage was a great success. They were to never have children of their own but Hastings adopted Marian’s three offspring from her first marriage. She was to see him through several tribulations, most noted of which was his impeachment when he returned to England. Acquitted after seven years, Hastings retired to a life of peace and contentment with his beloved. He passed away in 1818, aged 86, at Daylesford. Marian lived till 90 and died in 1837. The two are buried side by side at the Daylesford church. And to think it all began on Church Street by St Mary’s in Madras!